"The Cave of Cornelius" by Paul Capon illustrated by G. Whittam, 208 pages, published by Heinemann, 1959. Also published as "The end of the tunnel" in the USA in 1969. This copy is for sale. Contact tschuringa @ earthlink dot net (USA). 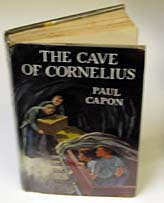 "The Cave of Cornelius" was written by Paul Capon and published by Heinemann in 1959. That was its original British title, and copies of it are scarce indeed. WorldCat lists only the Library of Congress as a holder in the US. 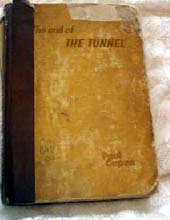 It was reissued in 1969 by Bobbs Merrill in the United States, and retitled "The End Of The Tunnel". It is an adventure story about a group of children that explored a cave near Stowbridge in England. When the children entered the cave, they soon came upon a pile of old coins, which told them that they were at the bottom of the local wishing well. They went further and found a subterranean river, which led them to an underground city that still maintained ancient Roman culture. The city was celebrating Saturnalia at the time. They had various adventures and eventually escaped from the city on a boat. One of the boys set his luminous wristwatch to midnight, because they didn't know what time it was and wanted to determine how far it took to get from the city back to the mouth of the cave. "Four children searching for a lost treasure of the Romans which they believe to lie somewhere in a cave near their home, stumble upon and into a secret world beneath the earth which is inhabited by descendants of the very Romans whose treasure they have been seeking. These people, with their debased Latin and their partly archaic and partly modern appurtenances, guard their secret and their habitat rigorously from the upper earth. Fortunately the children make contact with a contemporary who has long been a prisoner and who has the aid of a "native" girl. All escape by a complicated water and cave route which brings them out eventually in Paris - via the catacombs - with treasure and fame, leaving the secret of Sutteranea behind for good." I read it 41 years ago and have finally found a copy which I have now read again. It's a great little story.